Convert PPTs to video formats: AVI, H.264, WMV, MP4, MOV, etc. Powerful, easy-to-use, and versatile PowerPoint to video converter offering the most ideal way to convert your PowerPoint presentations (PPTs) to different format video files. 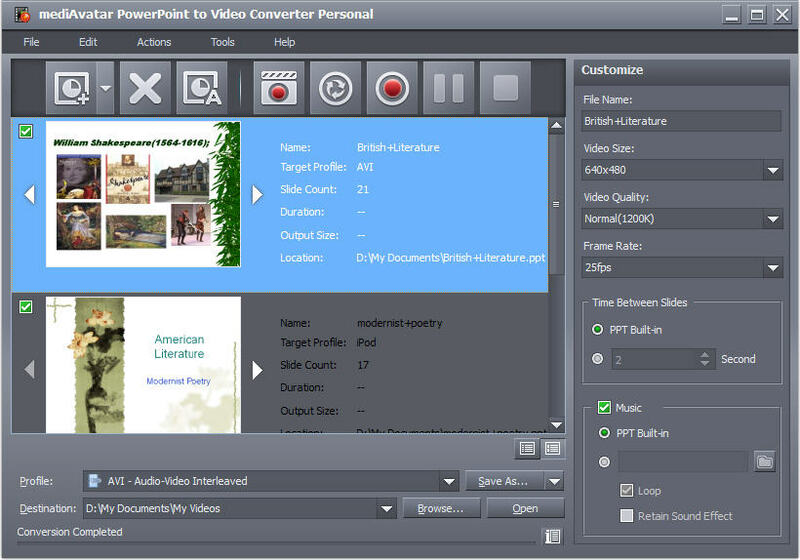 mediAvatar PowerPoint to Video Converter can turn PPTs into video as well as high-definition (HD) video files in full-HD 1080p resolution. mediAvatar PowerPoint to Video Converter supports most video formats including AVI, H.264, WMV, MP4, MOV, and HD-video formats including HD AVI, HD H.264, HD MPEG-2 TS. Installing Microsoft PowerPoint is not required. 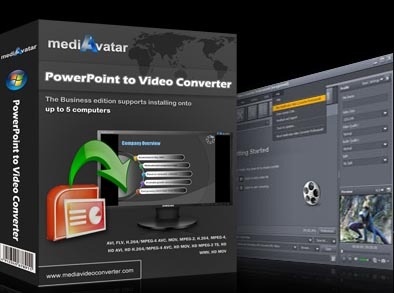 mediAvatar PowerPoint to Video Converter is also great for creating personalized video PPTs: rehearse and include your own commentary in your presentation, add background music, attach text or picture watermark, and set a range of output parameters. You even have the option of removing all original slide features from your PPT. Convert PPTs to video files in formats including AVI, H.264, WMV, MP4, MOV. View PPTs as HD-videos in full-HD 1080p resolution. HD formats supported include HD AVI, HD H.264, HD MPEG-2 TS. Makes PPTs viewable on mobile devices such as the iPod, iPhone, PSP, and BlackBerry. Convert your PPTs to FLV videos and share them on video-sharing sites such as YouTube and Google Video. Rehearse your presentation and record your own commentary once satisfied. Remove animation and sound effects from your PPT and get it converted with the highest speed possible. Convert your PPT directly to a presentation video without additional features. Retain all presentation slide features including animations, transitions, sound effects, actions and slide-show playback settings and even embeded videos in the target presentations video files. Attach personalized text or picture label to your video presentation and make your presentation lively by adding a music clip to your presentation. Convert your PPT to several formats at the same time by setting multiple conversion profiles. Set output parameters such as video quality, frame rate, and resolution to create a custom-made video presentation. Load multiple PPTs and convert the lot in one go – more efficient, less hassle. View your slides with the built-in player prior to PPT to video conversion. Supports all PowerPoint presentation file types created with all PowerPoint versions: ppt, pptx, pptm, ppsx, pps, ppsm, potx, potm, pot made by Microsoft PowerPoint XP, 2003, 2007 and 2010. Simple interface layout and user-friendly design. Start converting your PPTs to videos right away!